As a pianist, my hands are my most valuable asset I suppose. I’ve never been able to stand pain in my hands of any kind, and the thought of injury to my hands has always given me the shivers. Hands are both delicate and strong. With our hands, we give and take, push and pull, love and bless others. I’ve always been fascinated with hands, sketching them, photographing them. Baby hands are so very precious!! And my hands have become a way for me to communicate with my deaf friends through ASL. Please read this article by Randy J. Guliuzza, P.E, M.D. 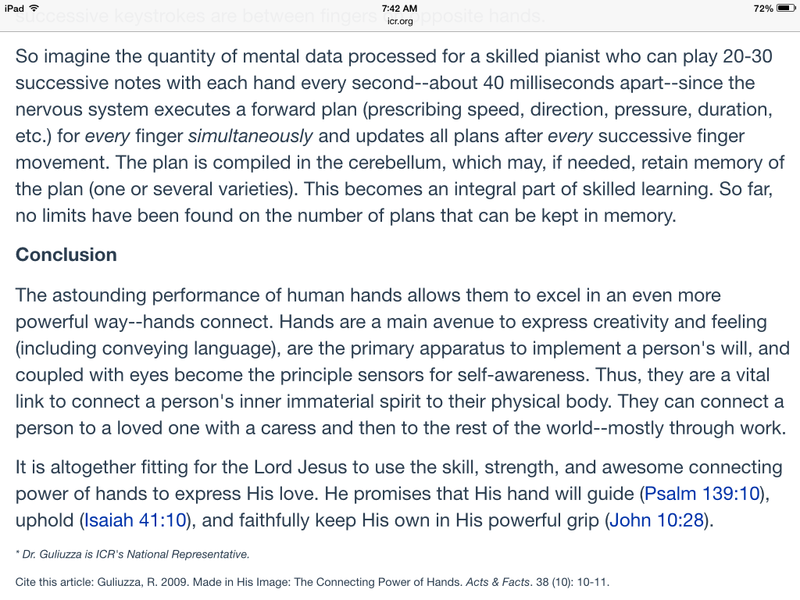 called Made in His Image: The Connecting Power of Hands. After finishing the last bit, I will never look at my hands the same way again. It seems to me that God has become the proverbial “elephant in the room.” He is huge and wonderful and fills the room. Everyone sees Him and tiptoes around Him and accommodates the space He takes. Like the elephant, God is obviously here and cannot be ignored, but NOBODY TALKS ABOUT HIM!! Like if we pretend He isn’t there, then maybe He will go away. I don’t want God to go away!! I cannot even fathom what this world would be like without God’s presence. I see Him in every sunrise and every sunset. I hear Him in the birdsong early in the morning and in the sound of the waves on the shore or the rain on the roof. God is reflected in the faces of my kids and grandkids, in my mother’s smile and my sister’s goofy laugh, in my husband’s hug and my father’s work-worn hands. When my dog curls up at my feet, it’s like God is saying “I’m right here with you.” Flowers! And music!!!! I don’t even want to think about what this world would be without God’s gift of music. So why DON’T we talk about God? What are we afraid of? What keeps us from behaving as though God were standing right next to us all day long, part of our conversations, our best friend? Why do we often treat our Maker as though He was the black sheep of our family rather than the reason we exist?? Or perhaps it’s more like the elderly aunt whom we only visit on Sunday’s and then we shout at her because she’s hard of hearing but the rest of the week we never think about her at all! No matter how dark my world gets, God is there and always has been whether I acknowledge Him or not. No matter how beautiful and wonderful my world gets, God… in all His majesty and glory and tenderness and mercy… is there smack in the middle of it. I love my Maker and my Maker loves me. The song in my head this morning is The Maker from Chris August. It woke me up before daylight, and the cool thing is that I haven’t heard this song in weeks!! Click here to listen. Featured image taken in Ifrane, Morocco courtesy of Karen Thomas Smith. It is truly a wondrous thing to know that The Lord of the universe quiets us with his love and sings over us with loud singing (Zephaniah 3:17.) It is something that I’ve come to depend on, to count on. Even more wondrous to me is that this same God knows exactly which song I need to hear! As I hear these beautiful words from Francesca Battistelli singing through my mind, I have just learned that my dear friend went home to be with the Lord. After fighting for all he was worth for years, he is finally and forever at peace and without pain. And while I sing of the Holy Spirit and my desire for more of God’s presence, my friend is IN God’s presence. While our hearts long for the glory of God, my friend is basking in His glory from now until the end of time. I am so thankful our God gives us little moments of joy in our lives that give us a glimpse of His glory here and now. An appetizer for the heavenly banquet to come. For me, nothing compares to watching my grandchildren dance, or hearing my 7-month-old grandson laugh out loud just because. The sheer joy of sitting in my porch swing listening to the birds and smelling the sweet fragrance of the lilacs blooming, watching God paint another stunning sunset. Flowers! Reading my son’s poetry and listening to his passion for writing… Hearing another son sing and the privilege of accompanying him. Those times when all my kids are home and hearing them laugh together. Just being in the presence of my children! Is that how God feels about us? Joyful just to be in our presence?? Holy Spirit, you are welcome here! Hello???? Are you getting this???? At five o’clock this morning, Journey was blasting from my husband’s cheap plastic clock radio… One of those $5 ones that doesn’t catch the FM station too well. Imagine “so now I come to you with open arms” paired with lots of static and white noise blaring in the dark at 5:00 a.m. I’m talking top volume here. My foggy brain was deep in sleep and hearing a completely different song and wondering why he wasn’t turning the clock OFF!! I fumbled in the dark, climbing across to his side, until I finally got it to stop. Apparently he had gotten up and failed to turn the thing off. Doesn’t he know I’m retired? The song in MY head was Drops in the Ocean from Hawk Nelson. So there I was, sound asleep with God singing these beautiful words over me. Speak Lord for your servant is listening! Click here to listen to Journey and Open Arms. Click here to listen to Hawk Nelson and Drops in the Ocean. The song in my head this morning has been there all night. It kept me from going to sleep. It was there every time I woke up, which was often, and it’s one of my favorites. These words humble me. The music forces me to sing harmony, and I can never get through this song dry-eyed. So rather than copying the lyrics in song form, I’ve written them as though I were speaking them, because that’s how I always hear this song. How deep the Father’s love for us! How vast, beyond all measure, that He should give His only Son to make a wretch His treasure. How great the pain of searing loss! The Father turns His face away as wounds which mar the Chosen One bring many sons to glory. Behold the man upon the cross, my sin upon His shoulder. Ashamed, I hear my mocking voice call out among the scoffers. It was my sin that held Him there until it was accomplished. His dying breath has brought me life. I know that it is finished. I will not boast in anything… No gifts, no power, no wisdom… But I will boast in Jesus Christ, His death and resurrection! Why should I gain from His reward? I cannot give an answer, but this I know with all my heart…His wounds have paid my ransom. It’s personal, this thing Christ did for me. His death on the cross was not some grand gesture for all of mankind as a whole. It was God’s love for ME that nailed Jesus to that cross. It was MY life He was saving! Everything I am and everything I hope to be is because of HIS immeasurable love lavished on me. His wounds paid my ransom. I am free. Unchained. Unfettered. And forever grateful. Featured image: the dogwoods have been spectacular this Spring in Kentucky. This picture focuses on the tree with the blooms as a bonus. If we focus on the tree on which Jesus died, the cross, we get the bonus of His love and mercy, His forgiveness and grace. Click here to listen to the Selah version of this gorgeous song. Click here to listen to the Phillips, Craig & Dean version.